Book Review - A Simple Cure - Lawrence W. Gold, M.D. This is the third book I have read by this author. THAT should tell you something! I love his writing style and more what he writes about. If you have ever worked in a medical setting of any kind as I have, you will recognize the tidbits of truth in these highly entertaining novels. We, the patients, sometimes forget that Doctors are also human beings and it is not always easy to separate their feelings especially if they happen to know the patient personally. 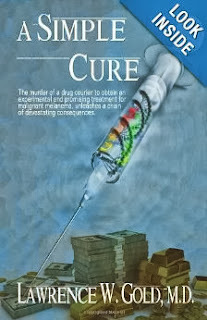 This fictional story revolves around the greed of the pharmaceutical industry and the desperation of patients in end stage cancer who will try anything, do anything for a possible cure. It also revolves around the scientists who, by virtue of their training, believe in sharing information but are sometimes stopped by corporate greed. 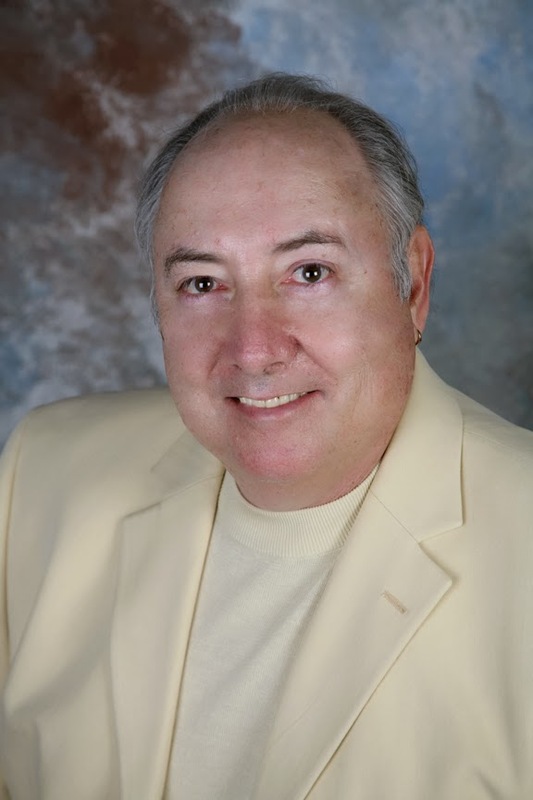 Dr. Gold has recently updated his website to include medical news worth knowing as well as information about all his books-it is well worth going in to browse around! A Simple Cure engages the reader in the search for the cure of malignant melanoma. While an uncommon skin cancer, one American dies of melanoma almost every hour (every 61 minutes). The incidence rate has tripled in the last twenty years. When nature, in her ultimate act of irony, strikes Richard Powell, a cancer specialist, with malignant melanoma, a highly aggressive form of cancer, his wife, Terri devotes her life to curing the disease that ultimately kills her husband. While research laboratories are characterized as noble in search of cures, and proprietary drug companies are caricatured as ruthless and materialistic, too often, the distinctions aren’t so clear. The murder of a drug courier to obtain an experimental and promising treatment for malignant melanoma, unleashes a chain of devastating consequences. I was born in the Bensonhurst section of Brooklyn, moved to Queens, and then, as New Yorkers say, my family ascended to the Island. After graduating from Valley Stream Central High School, I went to Adelphi, a college then, a university now, and then to medical school in Chicago. The war in Vietnam interrupted my postgraduate medical training with a year in Colorado Springs and another as a Battalion Surgeon in Vietnam. I spent seven months in the Central Highlands with the 4th Infantry and five months in an evacuation hospital in Long Binh outside Saigon where I ran the emergency room. I returned intact in 1968 to complete my training in internal medicine and diseases of the kidney, nephrology. I worked for twenty-three years in Berkeley, California in a hospital-based practice and served as Chief of Internal Medicine and Family Practice. For many years, I was an active member of the quality assurance committee. We retired in October 1995 before fate could intervene. We sailed under the Golden Gate Bridge for a life at sea in Mexico, Central America, and the Caribbean. Four years later, exhausted from repairing everything on board, (often many times) we sold the sailboat and within a year took the lazy man’s out; we bought a Nordic Tug trawler. We motored around Florida, the Bahamas, and the entire East Coast and Canada. I’ve written nine novels, five in the Brier Hospital Series, and one non-fiction book, I Love My Doctor, But…, a lighthearted look at the patient/doctor relationship. I write primarily to entertain, but I can’t help but pass on to readers observations and beliefs culled from years of practice, and yes, my biases, too. I strive for realism in portraying the medical scene which is gripping enough without melodrama or gimmicks. With even a minor degree of success in writing novels, comes responsibility to readers. I attempt to produce honest material that reflects my beliefs. Exposing these beliefs to the public through my writing requires courage, stupidity, or both. My fans have been generous, and although nobody enjoys criticism, I’ve learned much from that, too. The novel that expresses most clearly my candor, and my bias, is For the Love of God. The novel reflects my attitudes toward those who are willing to sacrifice the lives of their children for their personal religious beliefs. We live in beautiful Grass Valley with 15 year old Mike, a terrier mix and Bennie, an 8 year old Yorkie who just looks like he’s on steroids. Its so great to find an author that you just LOVE!!! I love a medical suspense book. I work in healthcare so my coworkers and I are always sharing new book. Great selection. We had a family friend die of melanoma at an early age. So sad. A subject so dear to me. Thanks for sharing this book with your readers. This actually sounds very interesting!!! I've never read a medical drama novel, although I've watched the TV series ER. It is very true, that while doctors are sometimes guilty of treating patients like numbers, patients will sometimes treat doctors as if they were robots! It is very unfortunate. But this is true for many professions, like working in fast food! Everyone deserves to be treated with basic decency. I will be looking for this book! Thank you! Wow! Sounds like an awesome read! OMG! I have witnessed A LOT of greed that goes around the medical industry in general. wow. This sounds like a really good read! This sounds like an interesting, well written and well researched book. I've added it to my TBR list. Looks like a great read! will def have to check it out! Thank you so much for sharing! This sounds like a great read. I love that hes didn't do the easy thing to do by having the character magically be healed. I've read a few articles about how the medications and the money we spend on them can be corrupt but I'm super interested to read this book! These books scare me more than horror books. Why? Because this stuff can and actually happens all the time. I would love to read this title, I will have to put it on my Amazon list. This is too close to reality for me...I'm always concerned that a cure will be covered up by a company so they can make a profit. Medical suspense may not my genre, but I'm glad you've found an author you like so much! It is awesome to learn a lot of books that are good reading. This one's intriguing. Thanks! My husband would love this story as he is into medical stuff.